This is the version of the story as Jules Verne had initially envisioned it. After his father’s death, Michel did extensive rewrites but published the story under his father’s name. To find out more about Michel’s version of the story go here. Two men both discover a meteor and lay claim to it, after it is discovered to contain gold, but another party has the knowledge and the means to bring it safely to Earth. Translator: Frederick Paul Walter & Walter James Miller. Editor: Frederick Paul Walter & Walter James Miller. Lincoln, Nebraska. University of Nebraska Press, 2006. xxi+224 pages, ?? ill. The Meteor Hunt, a translation of La Chasse au météore, is a work of the foremost literary importance, both within and outside its genre. This is one of the best Verne translations I have read (in over nearly forty years of reading Verne), filled with idioms vividly conveyed in a modern manner that reveals the experience of the team of noted Verne translators Frederick Paul Walter and Walter James Miller, the dean of American Verne translators. As the first critical English-language edition of an original version of Jules Verne’s posthumously published novels, and as science fiction, The Meteor Hunt is one of the most significant publications of its type. There are two major misconceptions about Verne’s later works. First, that they demonstrated a slackening imagination and literary ability, and second that they reveal a distrust of science which is distinct from the optimistic tone of his earlier, more famous books. In fact, such themes are not unique to Verne’s later output; they are evident from the beginning of his writing in such novels as Paris au XXè siècle (Paris in the 20th Century, composed in 1863, published in 1994), De la terre à la lune (From the Earth to the Moon, 1865), and Voyages et aventures du capitaine Hatteras (Journeys and Adventures of Captain Hatteras, 1866). Second, Verne’s later books, without the editorial guidance (and censorship) of his mentor, publisher Pierre-Jules Hetzel, are more slender and tightly plotted, devoid of extraneous matter. 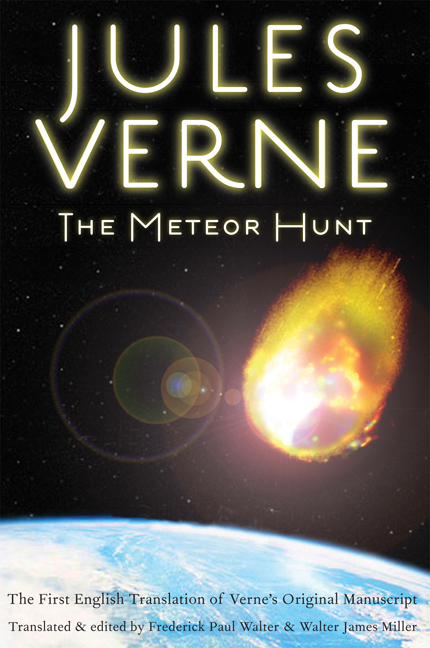 Verne’s focus is stronger, and The Meteor Hunt demonstrates this with its continual tracing of the meteor’s human effects, with only minor subplots that enhance the primary narrative. The Meteor Hunt also displays a warm cynicism, gently chiding the amateur scientists, the American competitiveness they represent, and the greed first for glory, then for gold that is a basic element of human nature. The tone of The Meteor Hunt is light, the characterizations memorable, full of sharp wit and delicate irony, with the whole perfectly plotted, a truly literary work. From the opening, with Judge Proth whimsically agreeing to the modern American wedding with the couple remaining on horseback, officiating with equal amiability at their divorce in the middle of the novel, and finally at the couple’s final reunion at the end, it is clear Verne’s interest is more in mood and more than science. The women of The Meteor Hunt are as strong-minded and independent as the men, and much more sensible. Much of the narrative takes place in the homes of the amateur astronomers Hudelson and Forsyth, and Judge Proth. The Meteor Hunt is probably Verne’s best domestic story. Verne paints the two parallel households of the sometimes fanatical astronomers, and the romance between the children of each that will soon have nearly Romeo and Juliet—style ramifications. The households are contrasts; one, dominated by women, is nonetheless a nuclear family, with the father, mother, and two daughters. The other is the patriarchal dwelling of a man and his nephew, surrounded by the surrogate family of the uncle’s astronomical assistant Omicron, with the only feminine voice that of his ever-challenging housekeeper Mitz. The astronomers themselves are fussy and choleric, literary descendants of the astronomers who are central characters in such earlier Verne novels as Les Pays des fourrures (The Fur Country, 1873), Aventures de trois Russes et de trois Anglais dans l’Afrique australe (Adventures of Three Russians and Three Englishmen in Southern Africa, 1872), Sans dessus dessous (Topsy Turvy, 1889), and especially Palmyrin Rosette in Hector Servadac (1877). The tension mounts as the two astronomers, simultaneously discovering the meteor, become antagonists, spreading the conflict to their families, ultimately igniting the partisan press and leading to an international rivalry. With the realization that the meteor is composed of gold, and descending in its orbit around the Earth, their own feud over its ownership is reflected in larger terms against the backdrop of the possible global economic ramifications. As international conferences struggle to resolve the matter ineffectually, Verne carries his satire to a new level, with a global indictment of competing national interests over an extra-terrestrial object. Verne first drafted La Chasse au météore in 1901, four years before his death. He had dealt with “outer space” twice before in his novels, in the duo of De la terre à la lune and Autour de la lune (Around the Moon, 1870), and in Hector Servadac, and together they contain the seed of La Chasse au météore. All of these are as much satire as “science fiction.” The two lunar novels offer a potentially rich comparison with The Meteor Hunt, especially considering both have an American background, but this subject remains unexplored in the commentary (surprising, since Miller authored an annotated translation of From the Earth to the Moon, published in 1978). In Hector Servadac (itself retranslated in 2007 by Adam Roberts in conjunction with the publication of his Verne pastiche Splinter), a patch of the Mediterranean and its residents are carried off into space when a comet glances the Earth. The original ending of Hector Servadac was to have the comet return, this time striking the Earth directly—but with consequences less environmental than monetary, for it is composed of one third gold, rendering the monetary mineral now plentiful. Hetzel compelled a rewrite that eliminated this climax in favor of one with Cyrano-style fantasy overtones, a dissonant ending that has long been criticized as incompatible with the rest of Hector Servadac. Perhaps it was in recognition that the idea deserved fuller treatment that Verne agreed to Hetzel’s demand, but he waited over twenty years, until after Hetzel’s death, to expand the idea into La Chasse au météore. Verne sought to explore what might happen if an extra-terrestrial object were to collide with Earth, composed of the very metal most valued, instantly overturning the basis for every monetary system. He was aware that any meteor of gold would have melted in the atmosphere, given the low temperature at which gold becomes liquid, but scientific accuracy was not the purpose in La Chasse au météore, any more than in Hector Servadac. Similarly, by having the meteor crash into the Earth with considerably less violent impact than would be the case facilitates a scene as the still-feuding astronomers can scarcely contain themselves from approaching it and being incinerated. Previously, La Chasse au météore had only been available in translations from a version rewritten by Verne’s son, Michel, variously entitled in English The Chase of the Golden Meteor (first published contemporaneously with the French edition in 1909) and The Hunt for the Meteor (published in 1965). The Meteor Hunt is unique among the original editions of the posthumous novels in that the reader can easily access a translation of the alternate text that Michel wrote: The Chase of the Golden Meteor was reprinted in 1998 by the very same press, that is now publishing The Meteor Hunt, but without noting the issue of authorship (as reviewed in Extrapolation, 40 [Summer 1999] : 181-184). From a literary standpoint, The Meteor Hunt is superior, especially for its translation and critical notes. Nonetheless, many readers, especially science fiction enthusiasts, will be curious to read the other edition. In this way the differences between the two texts may be explored and readers may decide on the respective merits for themselves. Michel makes his most substantial intervention in the novel by changing its genre from what might be most appropriately called speculative fiction into outright science fiction. Michel introduces the absent-minded savant, Zephyrin Xirdal, who has invented a device that is able to bring the meteor toward Earth. This shifts the book’s focus away from the rivalry between the astronomers Forsyth and Hudelson, and cuts many of his father’s reactions to American mores. Xirdal is a Frenchmen, transforming a largely American story into a truly multi-national one. This does fill in the major plot hole by explaining how the meteor, seemingly in permanent orbit, providentially begins to fall to Earth once its composition is known. Jules Verne is content to have it be a natural phenomenon, while Michel provides a classic science fiction explanation. While his father’s forecasts were usually limited to what could be extrapolated from the known science of the day, Michel went considerably beyond these confining bounds of probability. Xirdal becomes one more voice claiming ownership of the meteor, but proves to have a better natural humanitarian balance than the astronomers. Dismayed by the financial shenanigans caused by the meteor, and the rising nationalism it engenders, he realizes he cannot make the meteor his own personal property. He is also emotionally touched by how the feud over the meteor has separated the young lovers, Francis and Jenny. The addition of Xirdal enhances the theme of the private use of outer space and the ownership of objects there in a matter reminiscent of Verne’s own novels of the Baltimore Gun Club, and this topic has added resonance today as this region is impacted by non-government-sponsored endeavors. Michel transforms a breezy satire into a commentary as his version is even more suffused with the exploration of global greed. In this respect, he was following in his father’s footsteps, for the elder Verne had reworked La Chasse au météore shortly before his death, enhancing the international implications and financial speculations in the story. While lacking the effortless simplicity of his father’s expression, Michel deepens his father’s themes, adding to the melodrama. The Meteor Hunt is the first in a projected series of four Jules Verne books from the University of Nebraska Press that were previously translated only in the versions modified by Michel, using manuscripts that were discovered in the 1970s. The Meteor Hunt examines textual issues insofar as this particular novel, but neglects to provide a broader look at the Michel-Jules issue, surprising since this initial volume underlies the whole prospective series. The Meteor Hunt was translated from one of the seven posthumously published Verne novels that were guided into print by Michel. For many years, the Verne family argued that Michel’s changes did not go beyond stylistic polishing, updating, or possible verbal instructions from father to son; indeed the two had already collaborated during the father’s lifetime. Further, Jules Verne always drastically rewrote his books, often several times over, once he saw them in type, so his own hand-written version submitted to the publisher was never equivalent to the final edition in print. Whatever the reason or motive, Michel altered all the works posthumously published under his father’s name, in both minor and major ways, even originating two of the books himself. He expanded En Magellanie three-fold into Les Naufragés du Jonathan and infused it with his own leftist political sentiments; it was published in translation but without critical apparatus in 2002 by Welcome Rain (translated by Benjamin Ivry). Nebraska has just published William Butcher’s translation of the pirate adventure Le Phare du bout du monde (The Lighthouse at the End of the World, 1905), to which Michel only added a couple of pages and made other minor changes. The next two set to appear are Le Volcan d’or and Le Secret de Wilhelm Storitz (The Secret of Wilhelm Storitz, 1910); in both, Michel altered characters and climaxes. Subsequently, Michel carried forward his rewriting of his father’s stories as a movie producer, sometimes also scripting and directing, on six major celluloid adaptations of his father’s stories between 1913 and 1920. The story of Jules and Michel and their collaboration, both together and after the father’s death, is a saga of science fiction authorship that is only beginning to be told, and The Meteor Hunt and the Nebraska series do much to bring it to light for readers. -- Review by Brian Taves, “The Gold in Verne’s Meteor Finally Mined” originally published in Extraordinary Voyages, Vol. 15, No. 1 (Sep 2008).